So it comes down to listeners interacting with this beast, a theme-park ride of a record, while the artist, one imagines, pulls the covers over her head. First off, it is little, clocking in at a compendious 33 minutes. But given its twists and turns, its density and scope, the brevity of the work allows repeat listens to work out its strange but satisfying logic. As I told a friend: I can’t imagine a Syd Barrett or Brian Wilson or Todd Rundgren or Wayne Coyne not really liking this record. Prochet (b. 1987, Puyricard, France) began working on her sophomore project and releasing tracks (e.g. “Shirim”) in 2013. Rumor has it she threw away some of the material. Then last year she was involved in an undisclosed accident resulting in serious injuries. Her fans despaired until Bon Voyage was dropped in time for the summer solstice. Melody’s Echo Chamber (2012) was readily classified as “psych pop.” But for those who tire of musical taxonomies Bon Voyage is as open borders as they come. The opening track “Cross My Heart” begins with composite acoustic guitar chords followed by a swelling string arrangement, a mid ’60s Wilsonish verse, then a beat box section folding into a flute and percussion-driven jazz passage embellished with some fanatical bass lines. The lyrics here, as throughout the album, flow freely between English and French. We’re escorted back to the opening chords for a reprise of the main (?) verse and a riff-laden, cinematic flourish. As soon as “Breathe In, Breathe Out” drops a power rock groove the listener’s head-bobbing is interrupted by a trance section before the track accelerates again to its finish, the opening themes reworked but almost unrecognizable in the sonic whiplash. Prochet cites composer Olivier Messiaen (1908 – 1992) as a favorite, and perhaps what we catch on this record are flecks of his emphasis on color and unusual time signature. Good to have Melody’s Echo Chamber back — and this creature on the loose. Following in the wake of King Crimson, ELP, Yes and early Genesis, Van der Graaf Generator were pioneers of progressive rock that never cracked mass appeal, even in their native Britain. Not that they necessarily tried; VdGG’s music (created from 1969 to 1972, 1975 to 1978 and 2005 to the present) was acerbic, obsessive and challenging from the word go. Reveling in collision and contradiction, at once sharp-edged and tender-hearted, out of control and in sync, the music Peter Hamill, David Jackson, Hugh Banton and Guy Evans made on their 2005 reunion album Present and the resulting tour was the equal of what had come before — urgent, authentic, a triumph of their unique approach and chemistry, done for all the right reasons. Now Germany’s MiG Music has released the climax of that tour — Van der Graaf’s concert from the Leverkusen Jazz Festival, recorded for German TV’s Rockpalast, the only full length live video by the classic line up. This bargain CD/DVD set is strong stuff, with rough edges proudly on display; not for the faint of heart, yet ultimately life-affirming and absolutely essential. Our last glimpse of real beauty–NAO’s compilation album. Sam Healy–while complying with Big Euro Brother laws, regulations, and microintrusions–offered a wonderful teaser/trailer for the forthcoming North Atlantic Oscillation album, coming sometime this year. Granted, it’s only a full-eighteen seconds worth, but it’s eighteen more seconds then we had before. . .
Beginning in 1959, John Fahey’s “Blind Joe Death” excursions for solo acoustic guitar were the first to radically reconsider traditional blues and old-time music, extending by personalizing what Harry Smith did with the Anthology of American Folk Music (1952): rather than mythologizing what at that time was a largely unknown recorded legacy, as Smith did, Fahey made it breathe life, by quoting in his riffs on the traditional all manner of contemporary music. There is not a folk or jazz or avant-garde or prog rock guitarist who doesn’t owe Fahey a debt for this, for not only breaking boundaries — with which he was hyper-literate — but making such things seem irrelevant in the music he made. “On the Sunny Side of the Ocean” is from 1965’s Transfiguration of Blind Joe Death. It is a masterpiece of droning open-tuned right-hand wonder, building steam and dimension until it opens up with an unexpected pull off that turns the entire ship eastward on its perfumed journey. It is here, in this simple but everything phrase, that Fahey’s influence is apparent, as it would echo down the years through Popol Vuh and Opeth, just as Charley Patton and Mississippi John Hurt echoed through Fahey. Michael Karoli, Irmin Schmidt, Holger Czukay, Jaki Liebzeit, and Damo Suzuki, circa 1972. Across five albums and five years Can rendered the categories meaningless and set the bar for the kind of rock future that would make stars out of bands like Radiohead; there’s probably an argument that theirs is still the standard. Like the better so-called “krautrock” bands of the era, Can’s music sounds like little else, and the environment supporting such freedom became a magnet for American and British artists looking to stretch (Keith Jarrett, Brian Eno, David Bowie). But for such a self-styled experimental rock band, Can’s music is as accessible as it is confounding, a beautiful cut-and-paste mess controlled by disciplined musicianship (and editing). Noise, psychedelia, jazz, funk, world, new and no music vie for space in the grooves, battling, more often than not, to equal victory. By the time Can came to make 1972’s Ege Bamyasi they’d navigated a path through narcotic claustrophobia (Monster Movie‘s V.U.-summoning “Father Cannot Yell,”), cling-clang guitar trance (Soundtracks‘ “Mother Sky”) and long-form boogie freakout (Tago Mago‘s “Halleluwah”) butted up against concrete pieces that, to paraphrase Julian Cope, were guaranteed to clear the room at parties. On Ege Bamyasi they tighten the bolts — at least on record, as live footage from the time shows vocalist Damo Suzuki doing everything to not play along, with varying degrees of success — and come up with an album that contains, in the context of Can’s musical universe, a slew of pop-shaded nuggets. “Spoon” distilled all previous impulses into a succinct 3-minute masterpiece of Suzuki no-sense, Jaki Liebzeit clockwork, and Michael Karoli string-slinging wizardry, with Holger Czukay and Irmin Schmidt binding it all together. It’s the perfect mixtape “link” song: rhythmic, catchy, weird. It was a hit in Germany, adopted for a TV thriller and selling hundreds of thousands of copies. Successful bands have named themselves after it. It was and is — attractively to young, arty and ambitious Americans — roundly ignored in the States along with the rest of Can’s stunning catalog. And even unto itself it’s a marvelous thing. That second statement is undeniably true. Slowdive (released May 5 on the Dead Oceans label) is unmistakably the work of the same quintet that disbanded between 1995 to 2014. But it’s not a reunion record of rehashed old ideas. It would also be correct to say the band’s music has more in common with Floyd than, say, punk rock. Among their signature showpieces is a majestic, slow-burning cover of Syd Barrett’s “Golden Hair.” But Lark’s Tongue in Aspic? Other listeners can judge. Guitarist/songwriter Neil Halstead grew up in a home where orchestral music was preferred to pop, and that influence is strongly apparent in tracks like the stirring “Catch the Breeze” (1991). While Slowdive can’t be classified as prog, their body of work has occupied spaces progarchists can appreciate: ambient, avant-garde, dream pop, and experimental, all under the broader classification of shoe-gazing. In this vein no other band sounds like Slowdive. The cover art for Slowdive features a frame from Harry Smith’s 1957 avant-garde animated film, Heaven and Earth Magic. Composed of cut-out figures set in motion, the narrative includes a sequence involving a female patient sedated for a dental procedure. The darkened profile depicts her state of semi-consciousness, or perhaps heightened awareness. Or both. Shoe-gazing refers not to the contemplative state of the listener (though it could) but rather the guitarists staring down at the array of effects pedals used to achieve other-worldly sounds. None are better at this than Slowdive’s Halstead and Christian Savill. On the new record that prowess is everywhere present. But Slowdive also contains a refined attention to detail and form. The pace of the songs is faster. Nick Chaplin’s bass and Simon Scott’s drums thunder out front instead of being obscured by clouds of guitar effects, e.g. “No Longer Making Time.” And instead of a metronomic build-up common in earlier work there are tempo and time changes, e.g. “Don’t Know Why” and “Go Get It.” But as on previous records Rachel Goswell’s voice moves through the mix and around Halstead’s vocals like a spirit, e.g. “Sugar for the Pill,” the album’s emotional epicenter. The closer, “Fallen Ashes,” may be a preview of things to come. Showcasing Scott’s abilities with laptop software, it embellishes and pushes a hypnotic piano riff to sublimity à la Jonny Greenwood. Overall, Slowdive is familiar but with more sculpted contours and sharper pin pricks than in times past — a welcomed development. All of this works from a context of two-decades’ old material still very much in view, still relevant, still captivating. I had the great fortune to catch Slowdive in Carrboro, NC at the next-to-last date on the North American leg of their current tour. 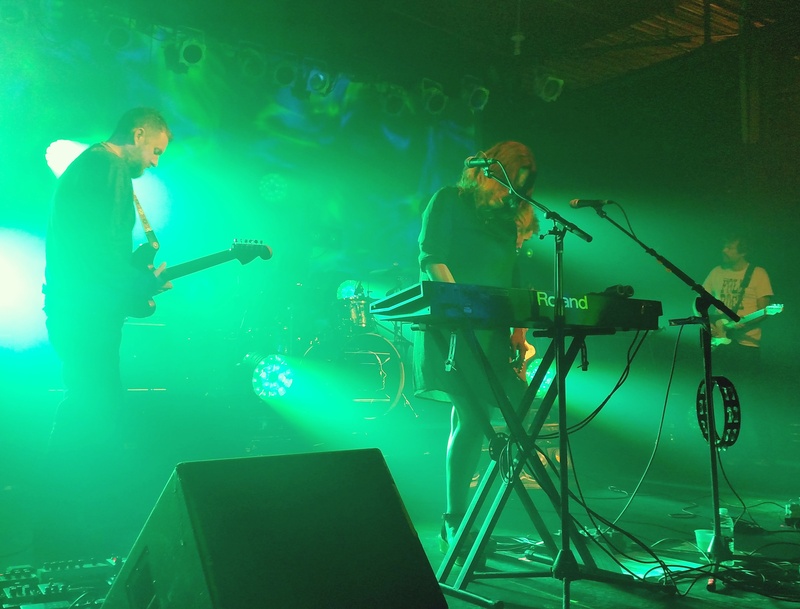 Blending half the new album with old material, Slowdive overwhelmed the audience with canyons of sound. I spotted a few fellow 50-somethings in the music hall. But more than a few of the audience weren’t even born when this Thames Valley gang first started making music as teenagers. Having fallen quickly out of fashion years ago with a press enamored to Britpop and cool Britannia, then beckoned back to life by an emerging cult following, Slowdive have a word for souls fearing rejection without redemption: No, this is what we do, and done well time will vindicate it. After opening with “Slomo” from the new album the band followed with “Catch the Breeze,” with Savill, Goswell, and Halstead leaning toward the floor, wailing guitars swelling to orchestral heights. During the rapturous finale I glanced to my left. A couple of people were actually weeping. Heaven and earth magic, indeed. Slowdive at Cat’s Cradle, Carrboro, NC, May 10, 2017. Photo by the author.